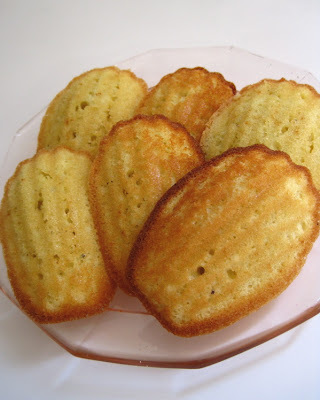 Recently I tried a new version of madeleines made with honey and Earl Grey tea. 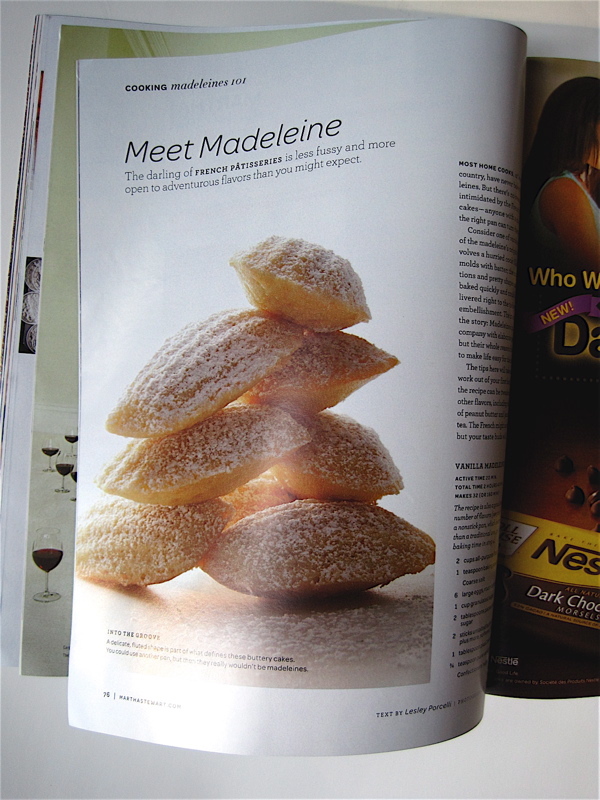 That is, apparently, just the beginning of the madeleine madness, at least according to a feature in the September issue of Martha Stewart Living. What kind of madeleines do they make? Chocolate, Olive Oil & Sea Salt, Maple, Jasmine Tea, Black & White, Spice, Peanut Butter and, of course, Lemon. The only one of those I'm not too sure about is the savory one with Olive Oil & Sea Salt. Would any of you want to try that flavor? Here's what the cover of this issue looks like. To be honest with you, if I didn't already subscribe I wouldn't have even picked up this issue because I don't care for the cover. 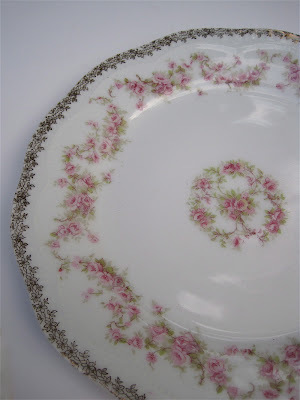 But it has some fun features, on blue-flowering bulbs, crafts made by decorating tiles with lace, and Martha and her daughter's amazing Jadeite collection. 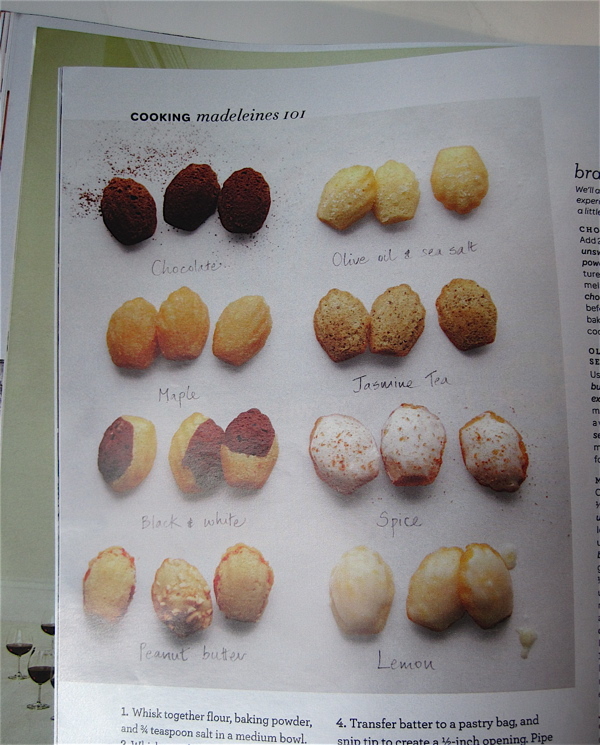 But if you're a fan of madeleines, as I am, you'll enjoy this issue because it's fun to see all the variations that are possible. 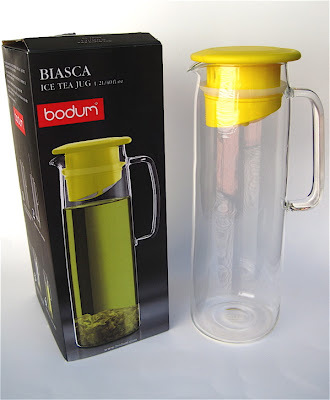 Some girlfriends and I were shopping at the Marshalls store near Perimeter Mall in Atlanta last week when I spotted this 40-ounce Bodum Biasca Ice Tea Jug. I've been straining loose tea out of tea pitchers all summer long, so this was a must-buy item. 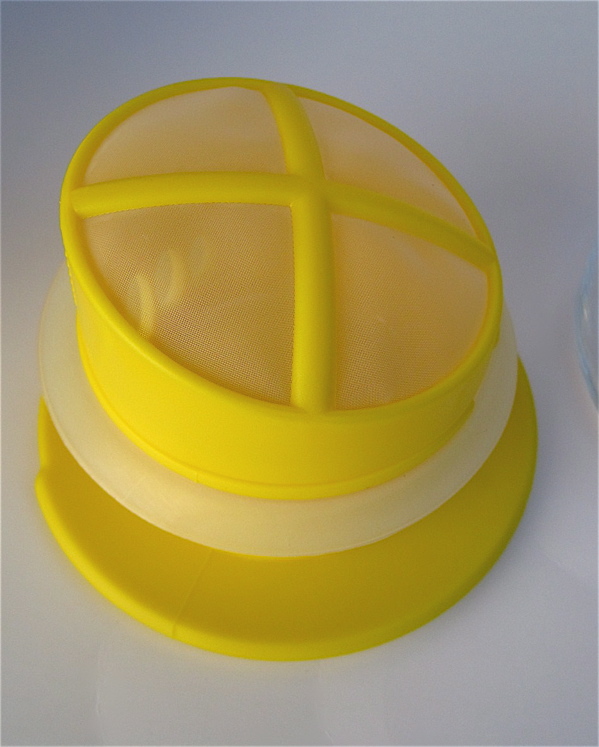 I couldn't decide whether to get the one with the yellow lid or the one with the green lid, but then I noticed the green-lidded version was $19.99 while the yellow-lidded version was $16.99. I think $16.99 is a prettier color, don't you? I was feeling a wee bit guilty about buying another tea product except a) this will make my life easier by saving me time and b) I saw it sells for $32.29 on Amazon, list price $53.50. Score! Love it! Not a speck of tea leaf comes out of the pitcher thanks to this fine-mesh strainer and rubber seal. 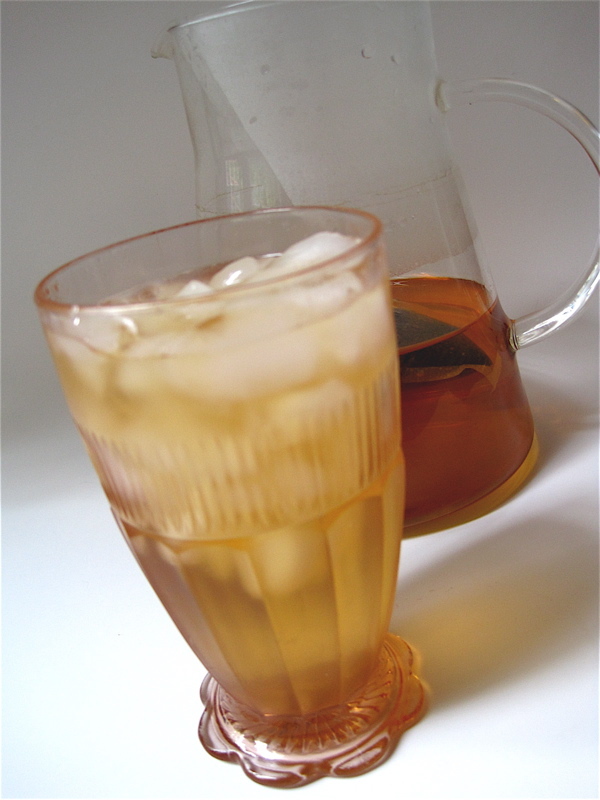 This tea pitcher is in fact made for cold-brewing tea in the refrigerator, just as I like to make it. If you do too, you may want to check out your local Marshalls! After my pie-making fiasco of a few weekends ago, I thought some of you might be pleased to know I *finally* had baking success this weekend! 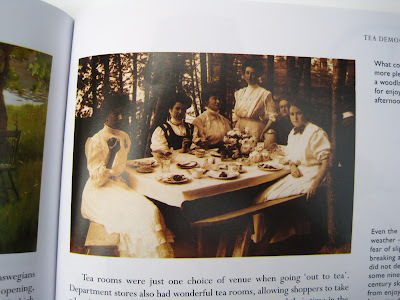 As regular readers know, I have been researching old department store tea rooms this year. Hess's in Allentown, Pennsylvania was home of the legendary Patio Restaurant, and while it wasn't actually a tea room, definitely not a white-tablecloth kind of place, Hess's and the Patio are so important in retail history that I think it would be a mistake not to include them in any study of department store dining. Plus, Hess's Strawberry Pies were so famous even Liberace once ordered them by the dozens as Christmas gifts for friends! 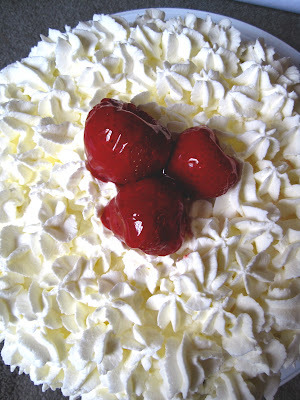 I simply had to master making some version of this pie. 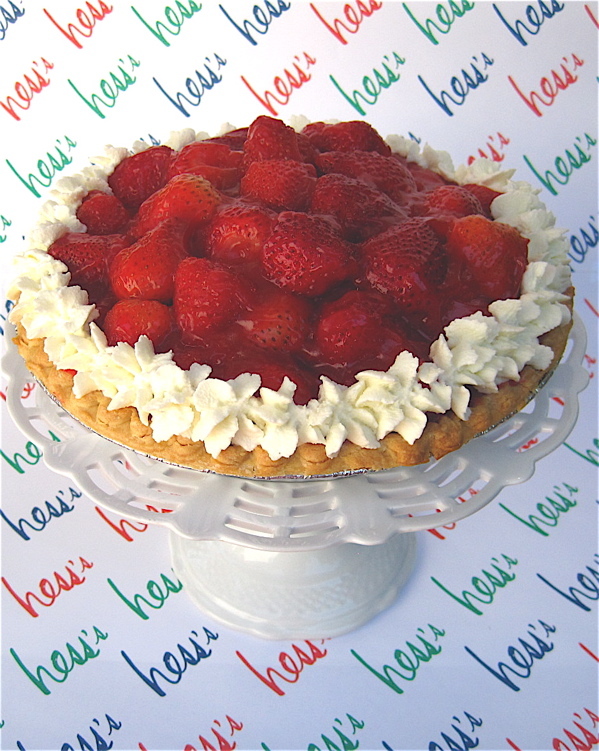 But let me hasten to say that I am calling mine a Hess-inspired Strawberry Pie. A wonderful PBS video shows the actual thing, and good heavens, that pie was a monster—8 inches high and 10 pounds! So I've scaled mine down, hopefully recalling a bit of the flavor of the original. Sure wish I could have shopped and dined at Hess's. Go here if you'd like to see the video, and tune in right at the 15 minute mark. This time, I used the cooking technique from one Hess's Strawberry Pie recipe I found and the ingredients from another Hess's Strawberry Pie recipe (there are quite a few of them if you look online). The ingredients from Michael Lisicky's recipe at lostrecipesfound.com worked best for me, although I did adjust some of the cooking method. Here's the pie recipe as I made it. In a medium saucepan, whisk together the 1-1/2 cups sugar, water and corn starch over medium-high heat until mixture thickens, about 5 minutes or as long as it takes to get a nice thick texture. 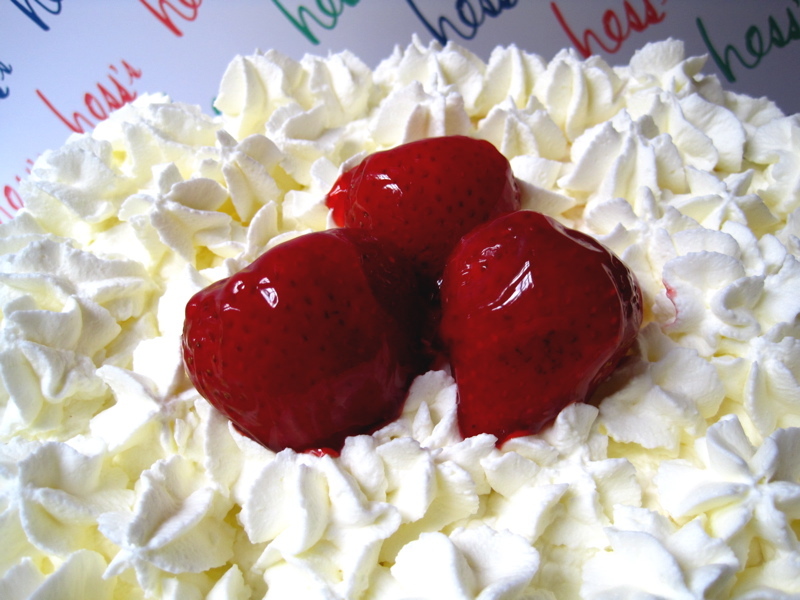 Stir in package of strawberry Jell-O and mix well. Remove from heat for a few minutes, then chill mixture in refrigerator until cooled but not set. Today I want to share both a favorite recipe I've made many times as well as some variations on the recipe. 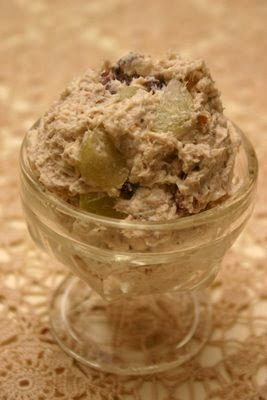 My very favorite chicken salad recipe is one I accidentally invented years ago. After reading Alexandra Stoddard's "Tea Celebrations," I decided to make her Tiny Chicken Waldorf Cream Puffs. I didn't want my sandwiches to be all that tiny, however, and I also didn't want the hassle of making cream puffs. 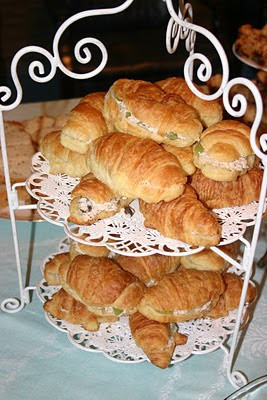 So I made my sandwiches with mini-croissants and was very pleased with them. One day I was writing down the chicken salad recipe for a friend and suddenly noticed that the grapes I had always included weren't originally in that recipe at all. 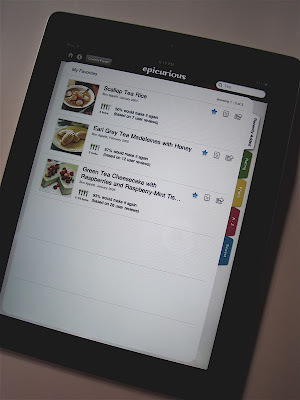 I'm not sure why I added them, I just know that I love the result, and that this has been my most-requested tea party recipe over the years. I've shared it before, but I didn't want to get to the end of this "tea sandwich year" without having this beloved recipe in the list of tea sandwich possibilities! Microwave the chicken breasts until done, then chop in a food processor. In another bowl, mix chicken with remaining ingredients and chill, preferably overnight so the flavors can meld. Do not skimp on the celery seed or you will regret it, as that is what makes this recipe! 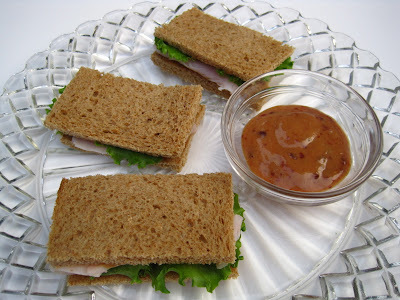 Variation: If you've got turkey leftovers at Thanksgiving this year, you can use this same recipe and substitute turkey for the chicken, as I did here. 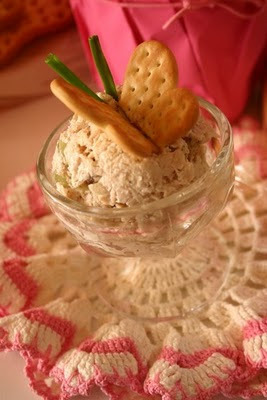 Garnish idea: Break Pepperidge Farm's butterfly crackers in half, add an inch or so of chopped chives for antenna and you have a quick and easy butterfly garnish for a scoop of chicken salad served in a sherbet dish! This week I read the most unexpectedly delightful book. It's the 1967 edition of "Macy's, Gimbels, and Me" by Bernice Fitz-Gibbon, the legendary advertising copywriter behind some of the most famous advertising slogans in history. What a smart cookie she was! I share her passion for good writing, and it was fun to learn how she came about coining some of her biggest hits. One I particularly like is the one she came up with for Macy's decades ago but which still rings true today: "It's smart to be thrifty." 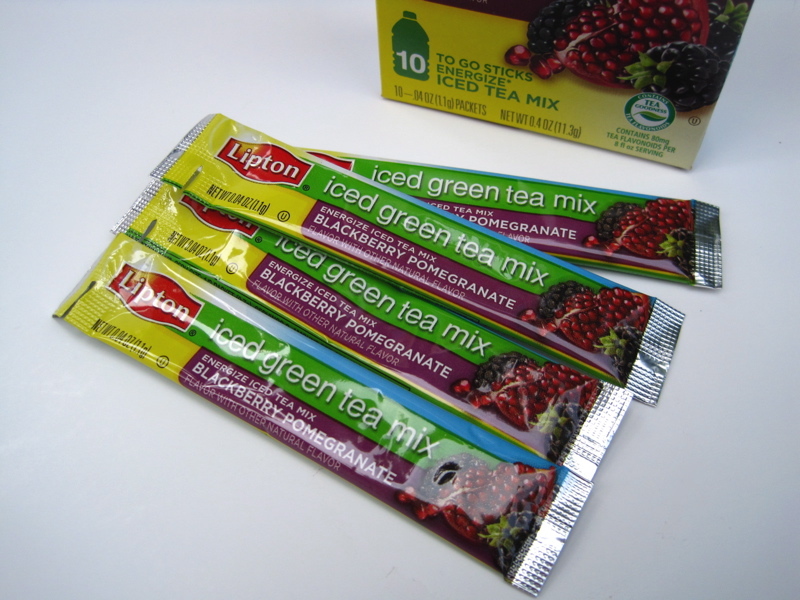 I tell you all this to say that my favorite way to be thrifty these days is by swearing off soft drinks and instead having with my lunch a bottle of water magically transformed with a powdered tea mix like this one from Lipton. These mixes rarely cost more than 20 cents a serving, unlike the 65 cents I would be paying for a diet Coke at the office. Of course I wouldn't care whether or not I was being thrifty if I didn't enjoy the taste, and this Blackberry Pomegranate flavor was a new one for me. 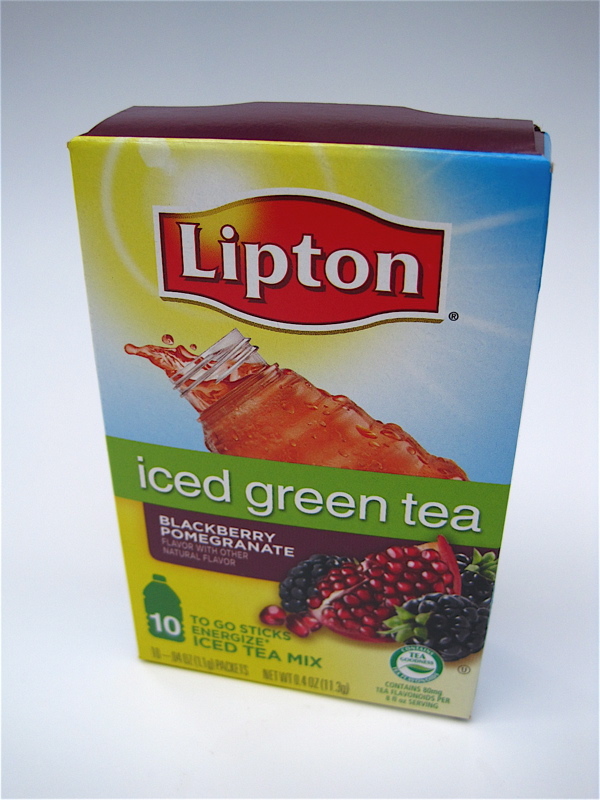 I hesitated before buying it, actually, because I have been disappointed in blackberry flavored teas before. But this one was very fruity and with just enough pomegranate to make it interesting. Eventually I plan to try all these powdered tea flavors. And why not? It's smart to be thrifty! 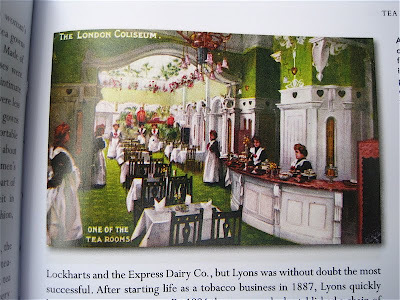 And I'd heard of the famous Lyons tea shops, but I did not realize the company actually started as a tobacco business! The above image shows another tea venue, an elegant tea room at the London Coliseum in 1905. Wouldn't you love to have taken tea there? 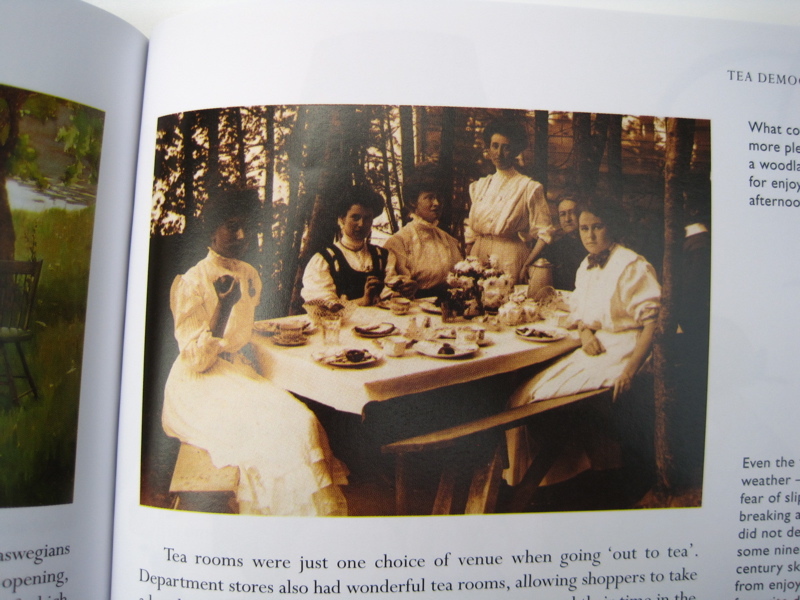 Tea drinking also became an outdoor activity in England, as evidenced by these ladies of the woods. 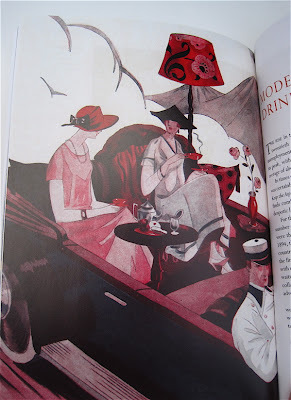 Another image in the book shows ice skaters stopping for a spot of tea. But perhaps my favorite image in the book is this one, which depicts "a French 1920s poster celebrating the fanciful idea of a 'tea promenade,' during which travellers would be able to savour tea and cakes while enjoying glorious mountain views from a luxurious, chauffeur-driven car." Now that's MY kind of tea party! (And a brilliant idea. Someone in the travel business ought to offer such an experience!) All in all, "Tea and Tea Drinking" is just a charming little book and gave me lots of new things to ponder in the wide, wide world of tea. We've still got quite a few weeks of iced tea weather here in my neck of the woods. I don't usually buy those teas billed as "iced tea" blends since the teas I've already got make iced tea just fine, but I saw this English Tea Shop Apple Melon Tea at Marshall's recently and, as a melon lover, had to give it a try! 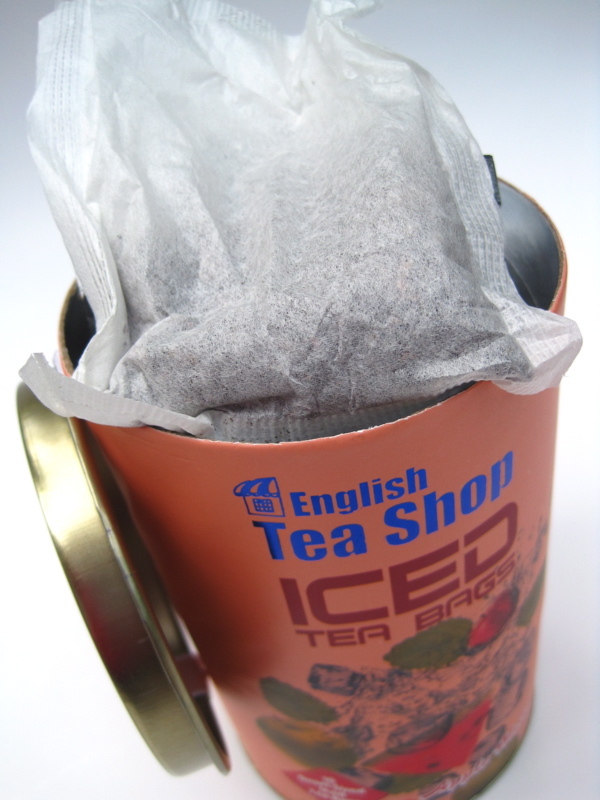 Each large bag makes a quart of tea, so I found this a very handy size of teabag. And oh my word, was this stuff good! 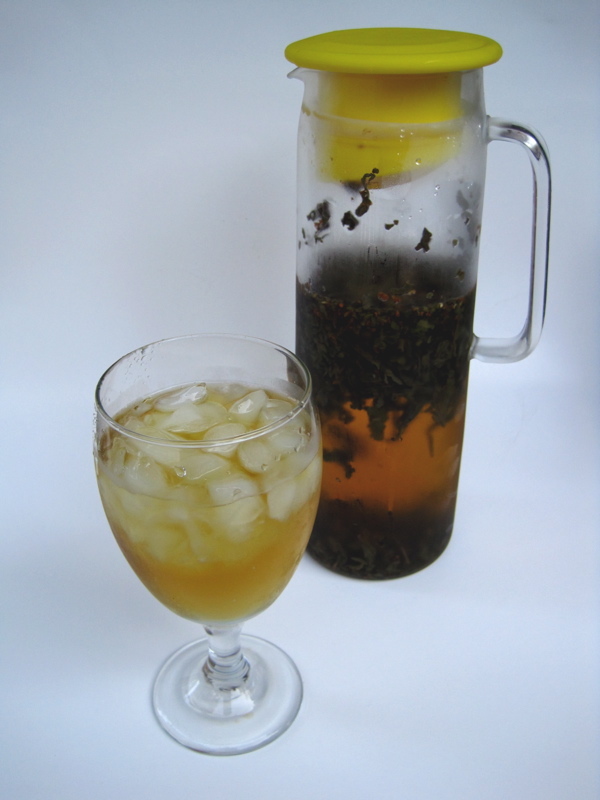 This blend contains black tea, peppermint leaves, apple pieces, and apple and melon flavoring. It reminded me very much of honeydew melon and had a crisp, light, fruity taste that was simply divine. If you run across some of this tea, I definitely recommend you give it a try! 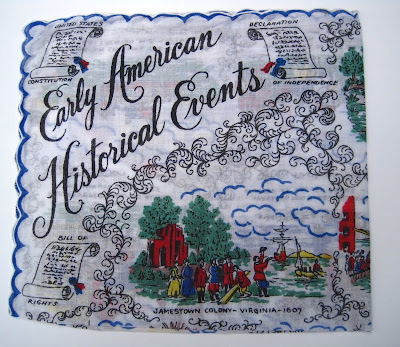 While visiting an antique mall with my mom and aunt over the weekend, I saw a nice stack of vintage handkerchiefs in a booth. I always do a quick dig through the stack for any featuring Christmas designs (not always easy to find) and any with teapots on them (very hard to find!). 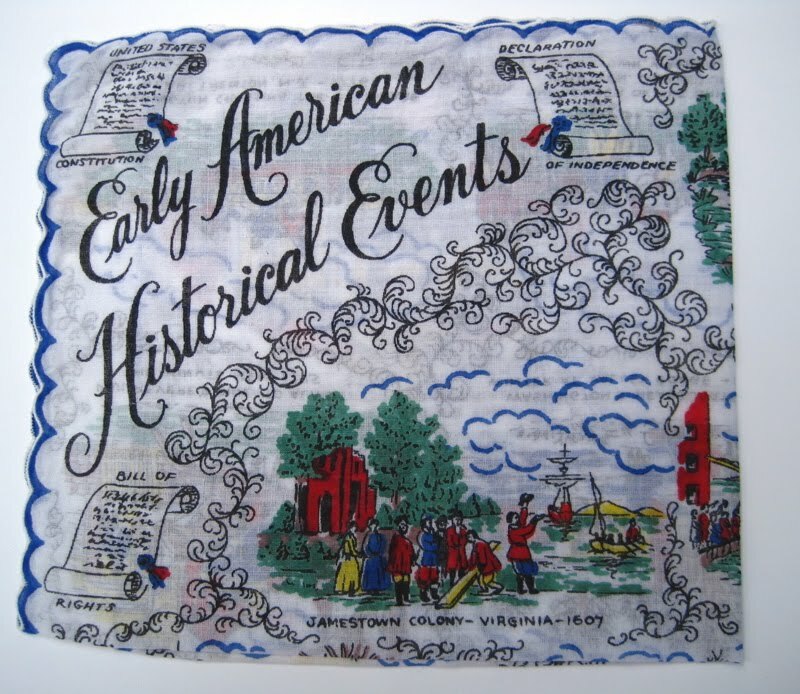 This one caught my eye since it was marked Early American Historical Events. Hey, do you think it might have included that famous historical event that's especially interesting to us tea lovers? Hmm. I quickly took the handkerchief out of the plastic bag and unfolded it to see. Yes! 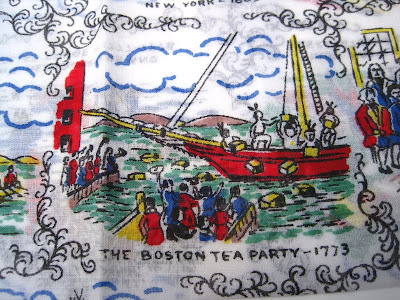 The Boston Tea Party made the cut! Sold! 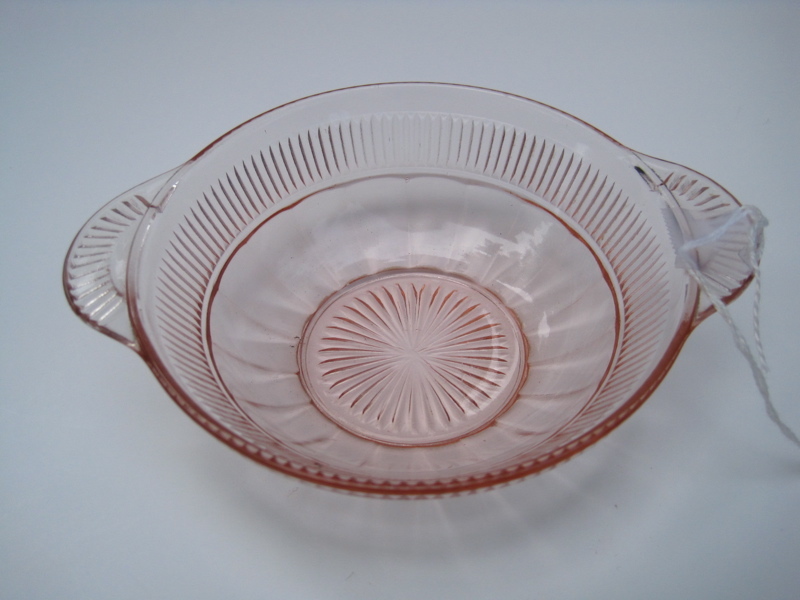 My other find was this sweet little handled bowl in the Coronation Depression glass pattern. Both my treasures were under $5, so that made me happy as well. 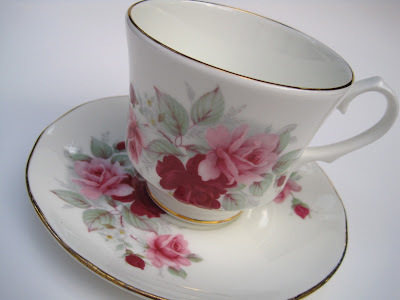 I'm hoping that by the time of the next coronation in England, I'll have enough Coronation pattern glassware to host a real "Coronation Tea Party." 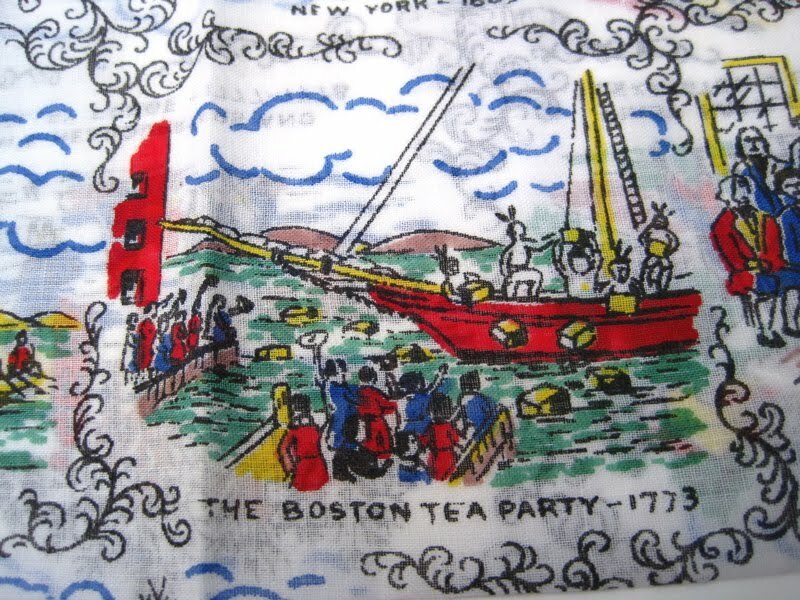 Kind of ironic, then, that I found this piece along with my Boston Tea Party commemorative handkerchief! Denise from California! If you'll send me your snail mail address, I'll get this kit in the mail to you. Congrats, and happy stitching! A few months ago I saw a new recipe for madeleines that I wanted to try one day. Over the weekend I wanted something sweet for a snack, and these Earl Grey Tea Madeleines were the perfect choice! Back in April, I got an iPad to serve as my new home computer. 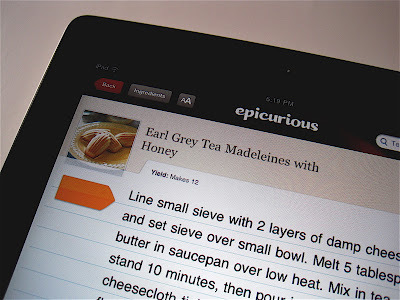 One of the first apps I downloaded was from Epicurious, and I was of course delighted to find a number of "tea" recipes there. I've also marked the Scallop Tea Rice and a Green Tea Cheesecake. But the madeleines made with Earl Grey infused butter and honey were tops on my list to try. I questioned the call for 2 full tablespoons of tea, but it imparted a sophisticated and subtle taste to the madeleines. The recipe got mixed reviews on Epicurious, with some of the bakers saying they couldn't taste the tea. I did, but my husband said he didn't, although he still thought the madeleines were delicious. And if you'd like to decide for yourself, well, you don't need to have an iPad. 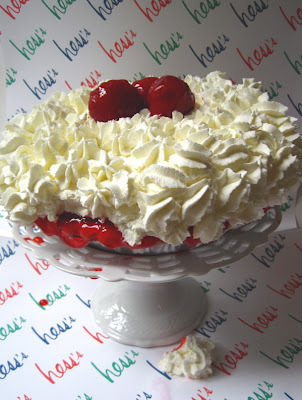 Just go here for the recipe! Let's talk turkey! This week I was in a meat-eating mood. 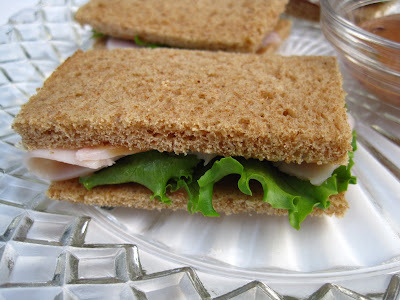 I found some thin-sliced whole wheat bread from Pepperidge Farm that looked interesting (and indeed I liked the taste), and to this bread I simply added sliced turkey and lettuce. 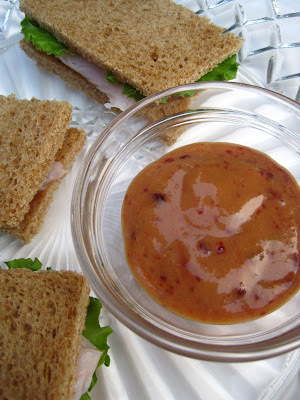 The magic ingredient of this sandwich is the raspberry and mustard blend that you spread on each slice of the bread. 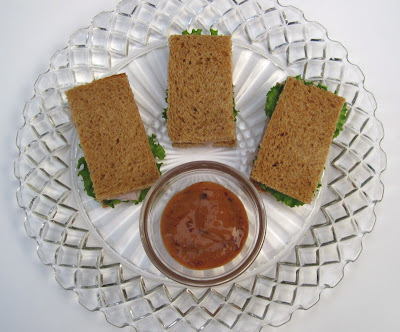 I used 2 parts honey mustard to 1 part seedless raspberry jam, which for these three tea-sized sandwiches meant two teaspoons of honey mustard and 1 teaspoon of the jam. When blended, you can still see bits of raspberry. It gives the sandwich a different flavor than plain old mayonnaise, yet it's light enough to go well with teatime. I also like the fact this blend could be made ahead of time and used to assemble sandwiches at the last minute. 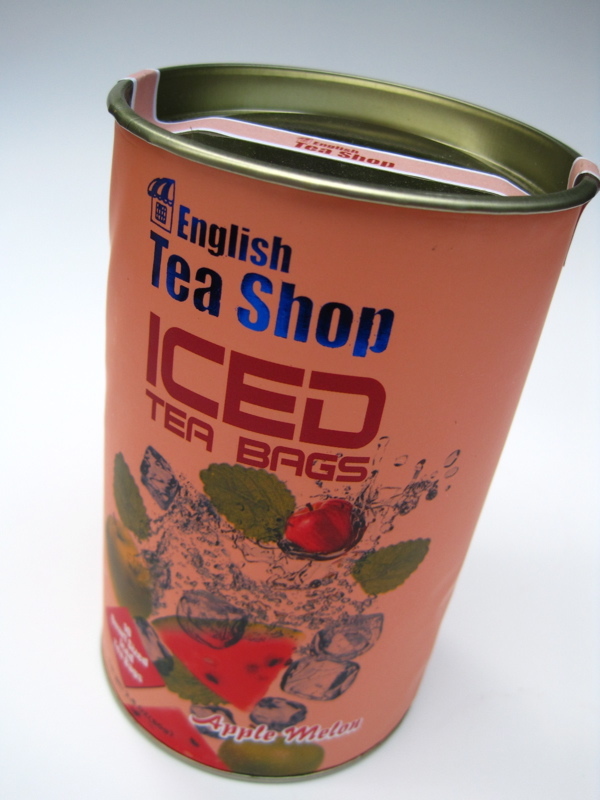 I've also, this week, been pondering "categories" of tea sandwiches. I say there are basically three: (1) Mostly meaty (anything with sliced meats) (2) Mostly creamy (cucumber with cream cheese, egg salad, pimiento cheese) and (3) A combination of meaty-creamy (chicken salad, shrimp salad, salmon and cream cheese pinwheels, etc.). So what do you think? Do you categorize your tea sandwiches? 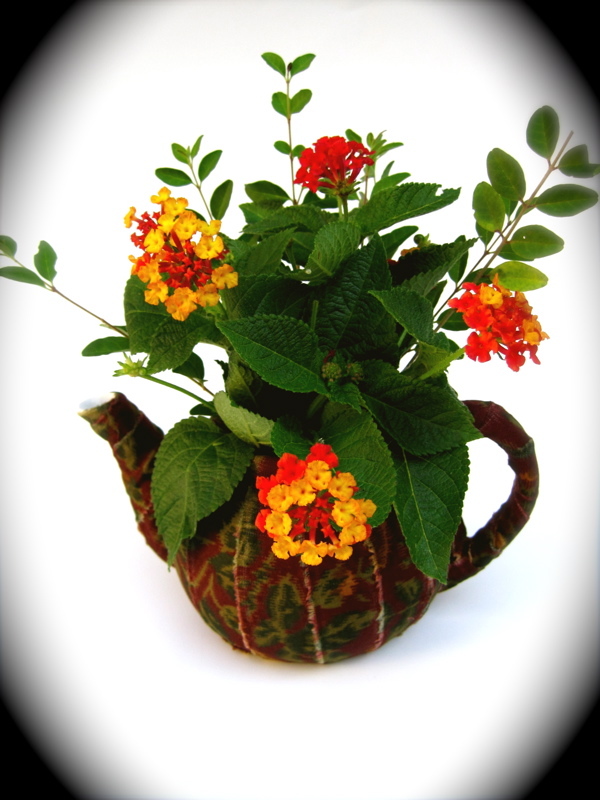 If so, what's a good formula for a teatime variety? I propose 1 meaty, 1 combo and 2 creamy. But then I like the creamy ones best -- except for weeks I'm craving meat! Want to win a fall teapot? 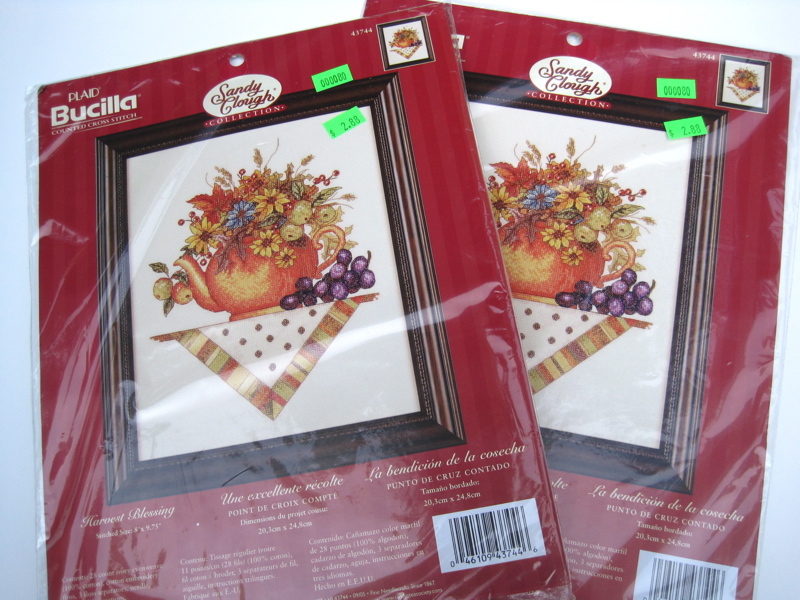 Are you as ready for fall as I am? We've had a cool spell here in Georgia this week -- it only reached 89 some days! -- and that's got more than a few of us ready for the next season to come on and show itself. 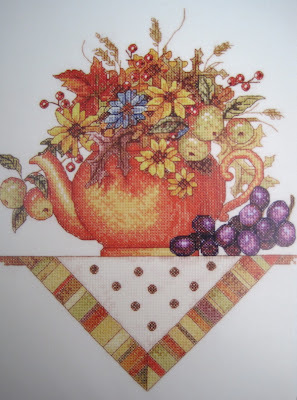 I think that's one reason I was drawn to this Sandy Lynam Clough cross-stitch design of a teapot when I found it at a thrift store the other day. I saw it on this brand spanking new kit which was marked just $2.88. 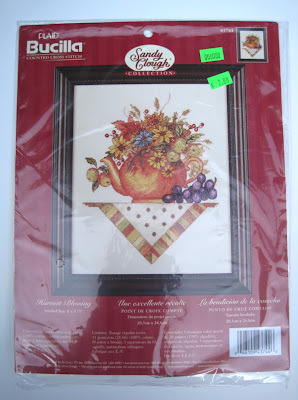 I haven't cross-stitched in years, but for some strange reason I have a hankering to pick up the needle again! Perhaps one of you feels the same way. I couldn't leave such a great and thrifty find for just *anybody* to buy since this definitely belongs with a tea lover. If you'd like to win this extra kit, just leave a comment before 7 a.m. EST Monday and you'll be entered to win! 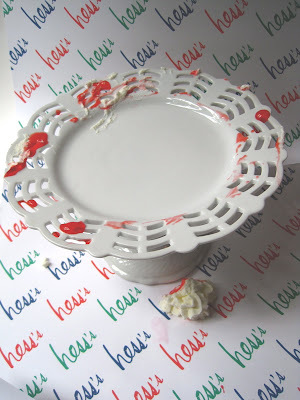 I've been looking for a pretty, smallish, luncheon-sized plate for weeks now. I've got a certain photo in mind, and I need a pretty plate for styling it. I checked eBay, antique malls, but nothing suited. 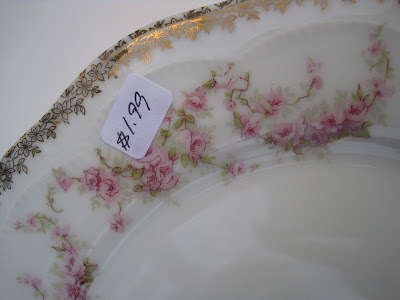 Then yesterday, I went across the street to visit my friends at What's in Store, and there was THE plate. Pink roses, softly-faded gold border, great shape. Loved it! It was completely a bonus that I also found this pretty English bone china teacup and saucer for $6.99. 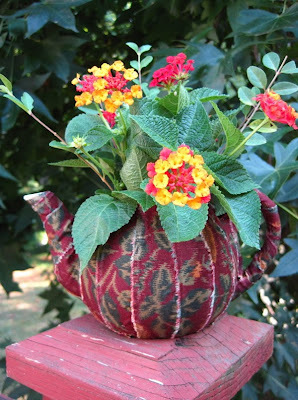 This will make a great fall teacup, don't you think? I am so ready for fall. In fact, if you'll stop by tomorrow, I've got a fall-themed giveaway that may interest some of you! 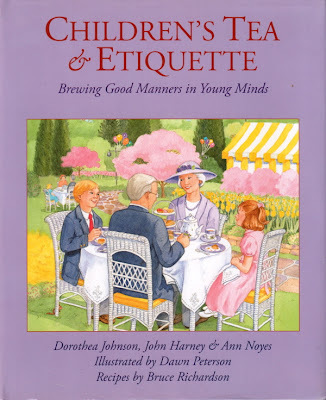 Recently I came across an inexpensive copy of a tea book that's been on my wish list for a while now, "Children's Tea & Etiquette - Brewing Good Manners in Young Minds." The book is a collaborative effort of a number of names well-known in teadom. The authors include Dorothea Johnson (founder of the Protocol School of Washington) and John Harney (of Harney and Sons tea purveyors) along with Ann Noyes. Illustrations are by Dawn Peterson, and recipes are by Bruce Richardson, known for his tea writings informed by his years operating the Elmwood Inn in Kentucky. With that stellar lineup behind it, I knew the book would be a good one, and it is. The tale is a simple one. Young siblings Harry and Kate are invited by their grandparents to attend an "Intergenerational Tea" where John Harney is speaking on the history of tea. To prepare the children for the event, the grandparents take them to an etiquette lesson with Ms. Johnson. 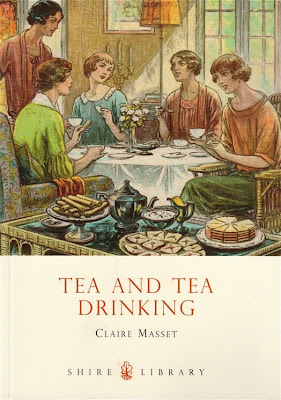 The story is depicted with lovely illustrations, and each two-page spread in the book has a charming border of teacups. The recipes include such teatime staples as Cucumber Sandwiches, Scones and Lemon Bars, along with other recipes I haven't seen before, such as Fruited Oatmeal Tea Cakes and Orange Coconut Sorbet. 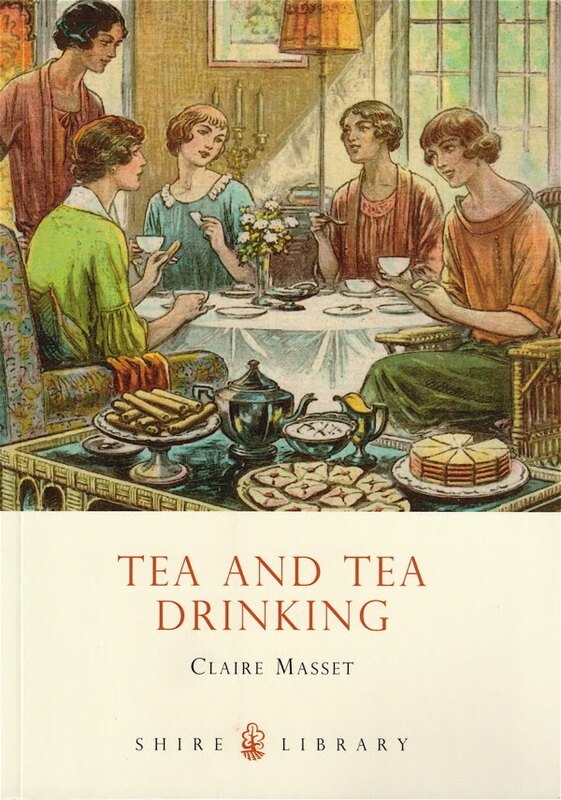 The book also includes information for grown-ups on how to prepare a proper pot of tea, making this book a good choice for young tea drinkers as well as any newcomers to tea who might be looking for a little guidance. 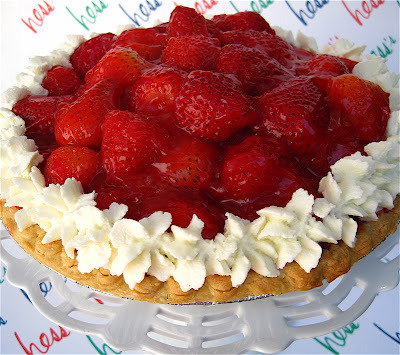 NEWNAN, GEORGIA - An unidentified local woman is being held in the county jail without bond following what police called a bizarre weekend incident involving a strawberry pie. Neighbors called in their concern after seeing large amounts of an oozing red substance seeping from the house. The woman, whom neighbors would identify only as "Angela," at first refused to allow police in her home and claimed to be making a pie for her internet "blog." 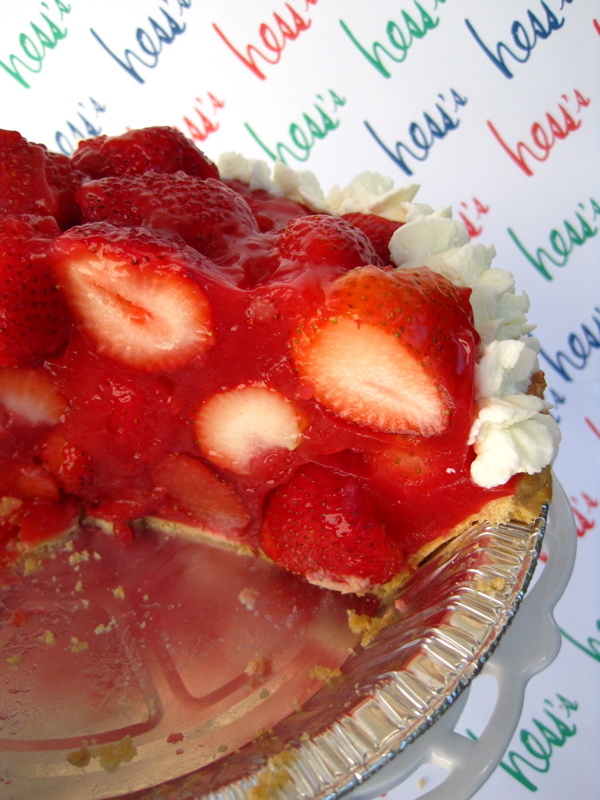 "It was supposed to be Hess's Strawberry Pie," the woman wailed. "That stupid glaze wouldn't firm up, and I was trying to save my pie!" 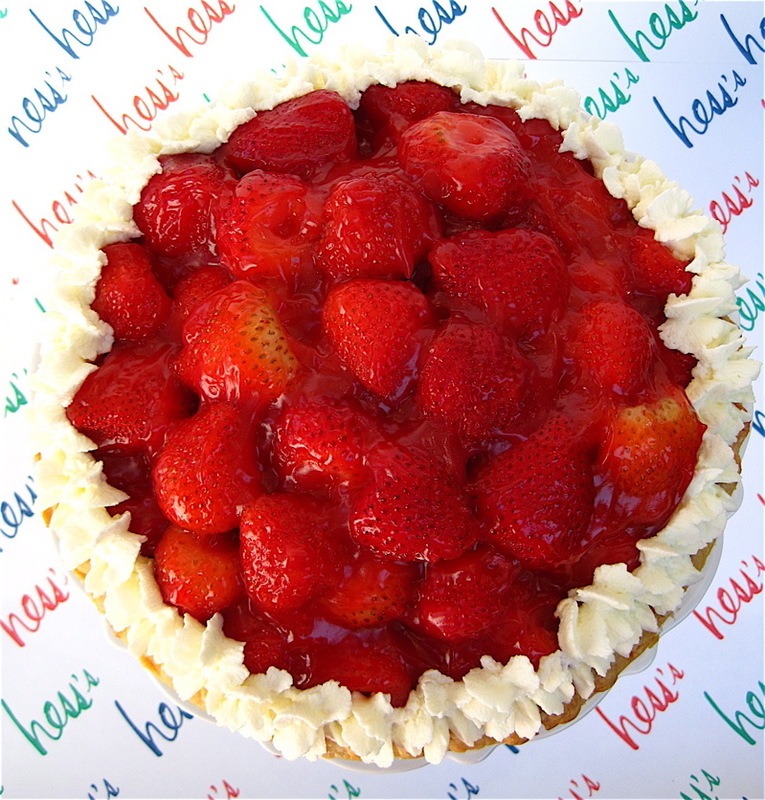 The woman claimed this was her seventh attempt to make this famous department store's pie and said she had spent more than $200 on strawberries alone thus far. 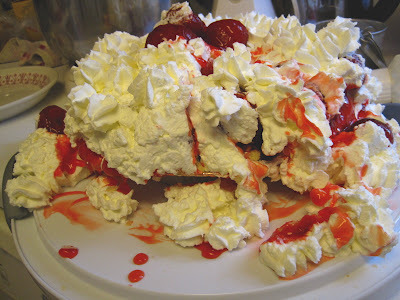 When she realized the latest recipe wasn't working either, she tried to disguise the overflowing glaze by piping heavy whipping cream onto the sides of the pie, but the booming sound of it falling off is what first alerted neighbors to trouble inside the house. "Apparently the little lady didn't realize it's called 'heavy' whipping cream for a reason," said Sgt. I.M. Pillsbury, who was in charge of the investigation. 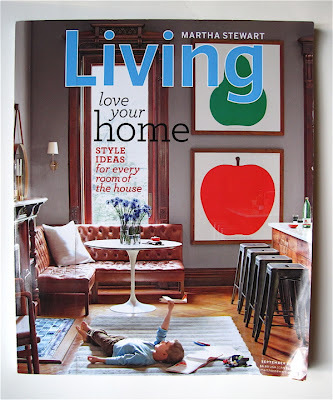 "By the time we got there, the entire kitchen and dining room were a total disaster. Red glaze was everywhere. I had grown men looking at that scene and crying. In fact, we're calling in grief counselors for a couple of 'em." Investigators said it appeared the woman tried to cover up her tracks by even removing the pie at one point, but the damage had already been done. "The perpetrator claimed she sliced that pie only once," said Sgt. Pillsbury, "but crime scene evidence suggests otherwise." 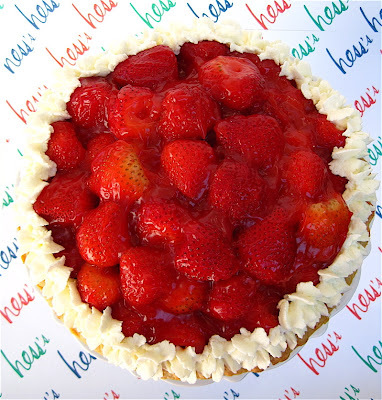 He said the woman was led away to a police vehicle shouting something about how this pie was costing her $37.19 per serving and she had to get it right so she could share it with some supposed blog readers. The woman is currently scheduled to undergo psychiatric evaluation. 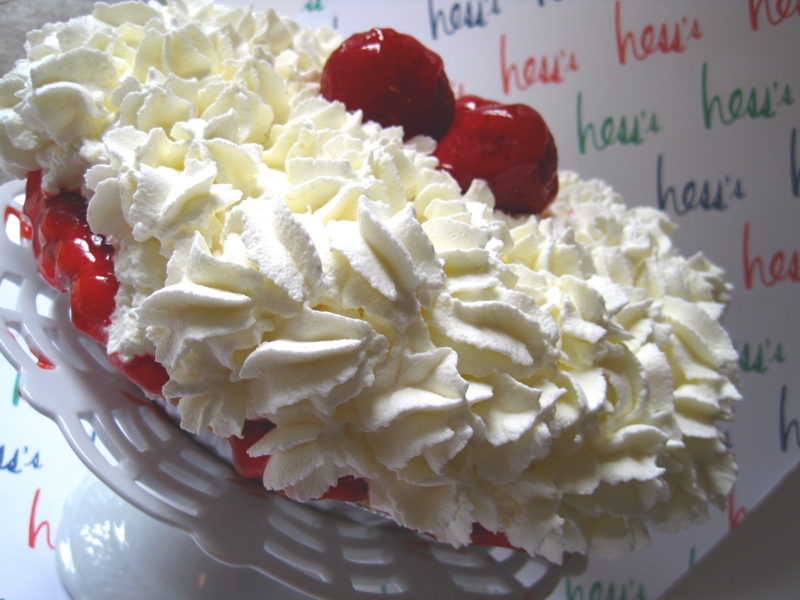 Funeral arrangements for the pie have not yet been announced. Ever see a craft project in a book that's so simple, you simply look at it and say "I can do that!" 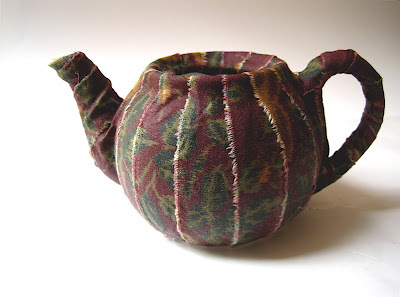 Well, I saw this one in a book the other day (and I'm sorry to say I've forgotten the name of the book), but it's basically an old teapot decoupaged with strips of fabric. You can make this in under 30 minutes, and if you're like me you've probably got everything you need to make it already! I am so eager for fall to get here I've starting gathering fall decor, and this fabric from my stash seemed like a good choice for fall. 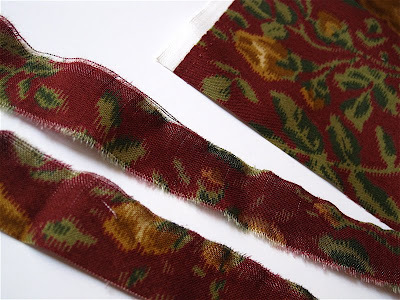 I cut the fabric into about 1-inch strips by cutting small slits in the fabric and then tearing them so I would get the texture of a raggedy edge. I like the word "raggedy." If any of you saw "The Help" over the weekend, one of my favorite scenes is the one where the town's chief trouble-making debutante is told to get her raggedy self (I paraphrase) off Mrs. Phelan's porch. "Raggedy." Great word. 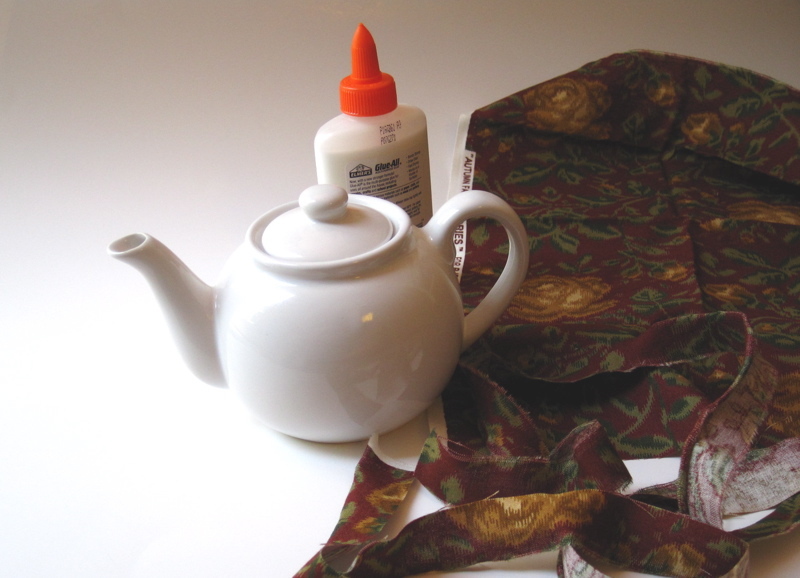 After making sure to cut the raggedy strips long enough to tuck over and under the edges of the teapot, I began soaking them in the glue-water mixture and applying them to the teapot, layering edge over edge. 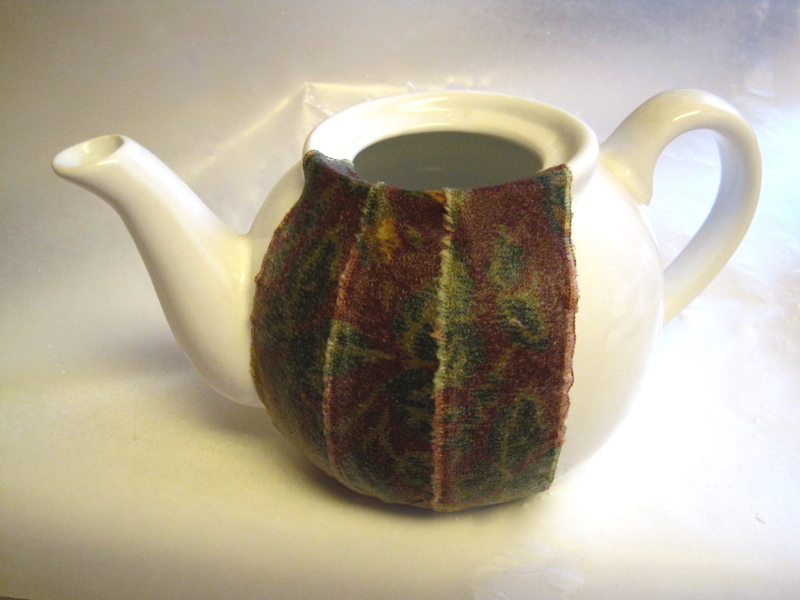 I placed waxed paper under my teapot as it dried so it would be easy to remove when finished. And there you go, an easy new floral container or planter. And when I get tired of this design, I'll bet I can just soak it right off and use the teapot again, but if not, I'm willing to sacrifice one small teapot for a good cause! "Tea at Fortnum & Mason"